The rapid destruction of Old Growth forests poses a serious threat to the health of ecosystems and the environment. Because of the long periods of time required for trees to grow to Old Growth stature the excessive use of lumber from these forests constitutes consuming an essentially non-renewable resource. Hawk Meadow Homecraft will take every opportunity to advise for, and research for alternatives to the use of Old Growth lumber. However, frequently in remodeling work the use of Old Growth lumber continues to be the most appropriate choice of material in a given application. The tight vertical grain and weather resistant resins present in very old trees is ideal material for many building applications. This occurs especially in exterior applications where Old Growth lumber's superior rot resistance, paint holding ability, and historical accuracy are demanded. Making the choice of what is the most environmentally appropriate material in a given situation is often difficult and uncertain. Hawk Meadow Homecraft will always provide an accounting in our contract with you itemizing any Old Growth components of your project. 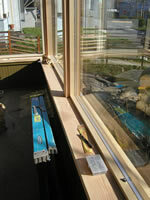 For the windowsills pictured above, clear lumber was carefully selected from the framing pile, avoiding the use of old growth material.